Yesterday I was fortunate enough to be in the presence of some of the finest and most influential members of the jailbreaking community. Scores of iOS modding enthusiasts, reporters and developers turned out for the first ever jailbreak convention, now called JailbreakCon (formerly MyGreatFest), of which Redmond Pie was one of the key sponsors. The Old Truman Brewery in Brick Lane, London, was the venue and there was a tremendous amount of excitement and anticipation as the crowd eagerly awaited the start. First in the spotlight was developer Aaron Ash, behind some of the fine tweaks we use today including Barrel and Multifl0w. 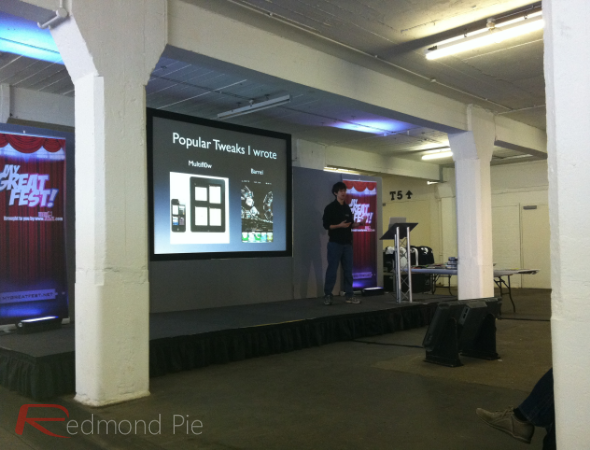 He covered many key areas affecting the jailbreaking scene, and began his keynote by giving background as to how tweaks are made and the general jailbreak infrastructure. He was then questioned on his stance on piracy of his work, and how much money he has potentially lost. Barrel is installed on 3.5 million jailbroken devices – a huge number – and how many of those are paying, legitimate users? The answer is less than 2%. That’s right, a mere 1 in 70 of those enjoying those enhanced SpringBoard effects have purchased a license. If the ‘scene’ as it were is to continue thriving and developers are to put such time and effort into creating the great apps and tweaks that we all love, then users need to remember how important it is to support the developer. How can we expect talented guys like Aaron to work tirelessly and continue updating creations when they’re not being duly compensated? He also briefly touched on the recent trend of developers being approached by Apple. Although the fruit company has never requested his services personally, he did state that those who are gaining experience in Cupertino – notably Peter Hajas, Comex, (and possibly MuscleNerd) – are in a prime position to help improve iOS in general, and that it is a positive thing for the growth and development of Apple’s mobile operating system. 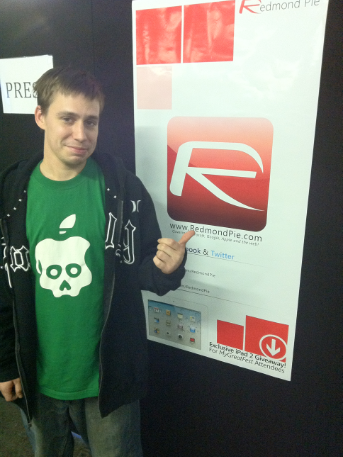 Aaron was swiftly followed by Joshua Hill aka p0sixninja from the Chronic Dev Team – the guys behind the Greenpois0n untethered jailbreak for 4.2.1, as well as the first incarnation of JailbreakMe. He covered much of the history of the Chornic Dev Team, as well as the cat and mouse between hackers and Apple which often ensues. Interestingly, he also gave jailbreakers some exciting news regarding an iOS 5 (on iPad 2 and possibly on yet-to-be-released iPhone 5) untethered jailbreak, which was widely expected to be a strung out debacle considering the work Apple has been putting in to make security as tight as possible . Apparently, as many as 5 potential userland exploits have been discovered, which could mean a swift clean jailbreak of the iPhone 5 once its released. Although he gave no guarantees, he said "we’re as ready as we can be" without actually being in possession of the as yet unreleased device. For those interested, he also plugged Chronic Dev LLC, a new consultancy firm created by the CDT specializing in mobile devices. It is looking for talented developers and hackers, and p0sixninja stated that it hopes to "train the next Comex" through the company. After an extended break for giveaways (Redmond Pie sponsored an iPad 2 giveaway which was won by @charlieraf) and lunch, 4 hackers thrust into the spotlight to talk about various project they have going on regarding running Android and Linux on Apple devices. The group demonstrated some success, and are working on a project whereby iPhone, iPad and iPod touch users will be able to dual boot iOS and Android. A very interesting prospect indeed. 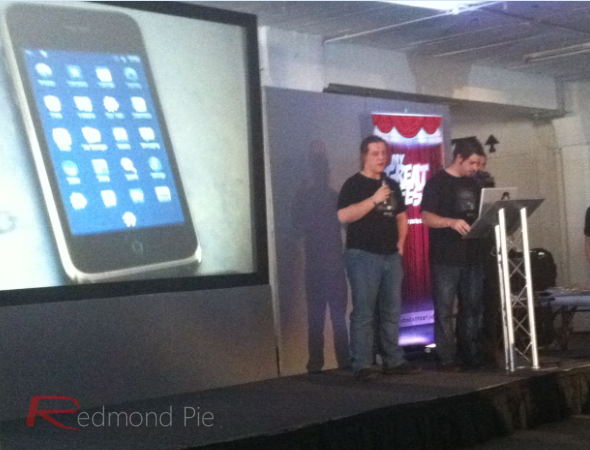 Next up was the developer of iFile, an essential tool for anyone using a jailbroken device. Aside from giving an overview of how the app works, he also continued the debate somewhat on piracy and how it affects developers. Despite having security measures in place to stop people using the cracked version, it’s an uphill battle. He offered those present at the convention using a cracked version of iFile a free license, which around 10 of the younger members of the audience took him up on. It was a fantastic gesture, and after watching the presentation, hopefully the youngsters may think twice about pirating apps in the future. 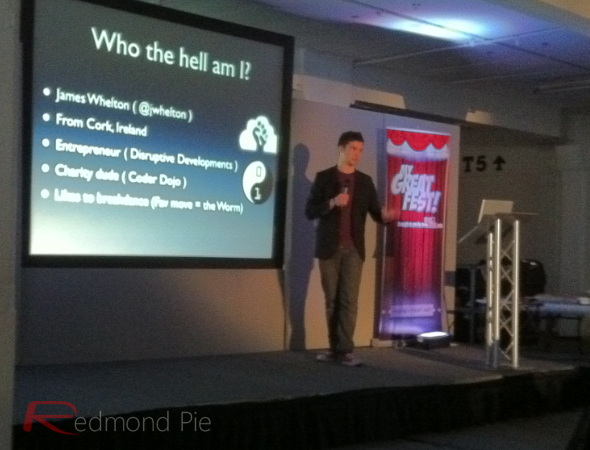 Following the iFile presentation was James Whelton, a young Irishman who discovered the first exploits in the 6th-gen iPod nano. Due to a fair amount of studying, the project had to be put on hold, but now he is in a position whereby he can dedicate some time to really scrutinize the innards of Apple’s smallest nano to date. Aside from iHacking, he touched on a few of the side projects he has going on, such as Coder Dojo, a charity organization in Ireland to encourage and train youngsters to learn how to code. Being one of the youngest on the stage, he demonstrated maturity and level-headedness which far surpasses his 19 years. With several business ventures already on the go, he is sure to go a long way. The final speaker of the day, without meaning to disrespect those before him, was the one everyone had been waiting to see. The main event. The showstopper, as it were. 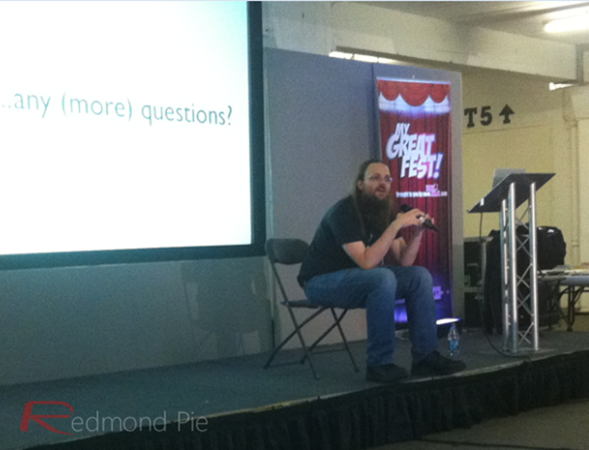 Jay "Saurik" Freeman, the mastermind behind Cydia – the nucleus of each and every jailbroken iDevice – took center stage. Having already become acquainted with him during lunch, I had gotten to see first hand how incredibly intelligent he is. He speaks with a kind of self-assurance and articulacy which draws in his audience. 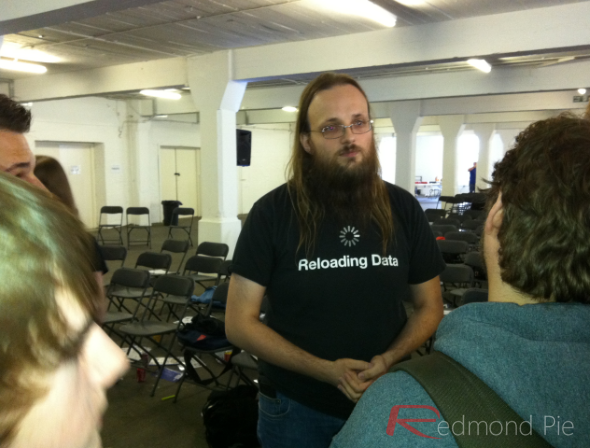 He spoke of the trials and tribulations involved in trying to secure the Cydia.com domain name, which is currently owned by a Chinese domain aggregator (squatter), who, according to Saurik, own 37,000 domain names and "almost every random sequence of 5 character domains", based on dictionary entries and keyword searches. Having contacted the company holding Cydia.com back in late 2008, he offered them around $1000 dollars to purchase the domain, which was met with "we will only sell the domain to you if we get to do all the marketing for the project", an offer which, as you would expect, was defiantly and abruptly turned down by Saurik. 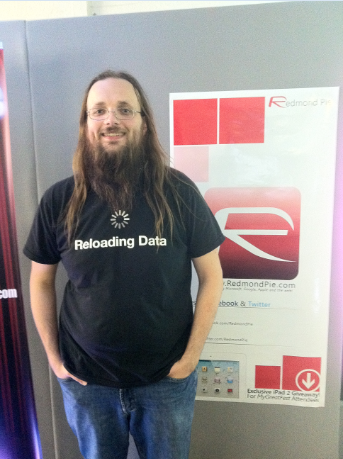 In the week following the inquiry, the domain squatters then began turning the site into an iPhone-based portal with various app-related features, which left Saurik unhappy to put it mildly, and left him facing a legal battle, which is still ongoing. He hopes, as does undoubtedly the jailbreak community, that a resolution can be found and Cydia.com will return to the morally rightful owner. Within the speech, there were constant burst of humor which made the keynote all the more enjoyable. 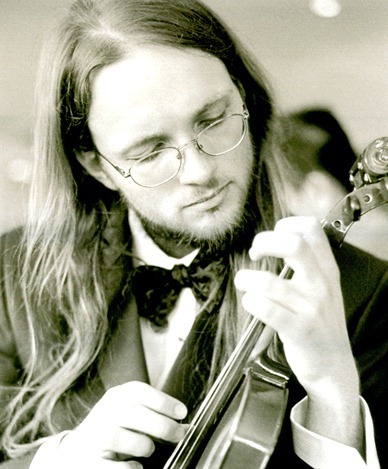 From "Apple not even acknowledging" his existence to confirming that he indeed doesn’t play the violin anymore, despite the fact that many of the pictures of him online, such as the one above, show him holding one. He covered everything an everything in the 35 minutes he was at the helm for, including the news that there will eventually be a newer and improved version of Winterboard at some stage in the future. 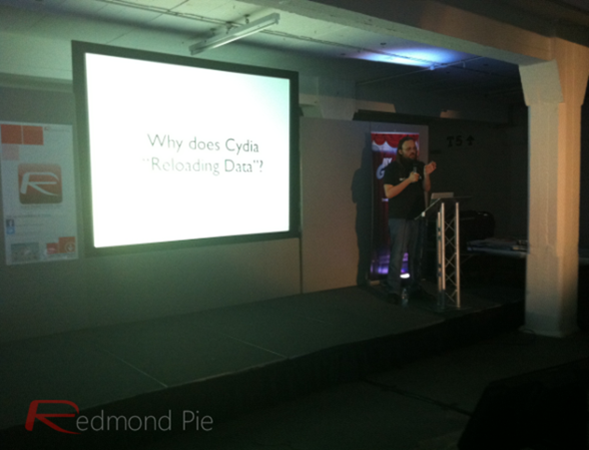 He also talked about Cydia for Mac, which is also a project he is pressing on with. It would certainly be an exciting concept, and it would be interesting to see what kinds of tweaks would end up in such a store. All in all, it was a fantastic day, and a great success and a credit to the organizer-in-chief, Craig Fox, and his dedicated team. 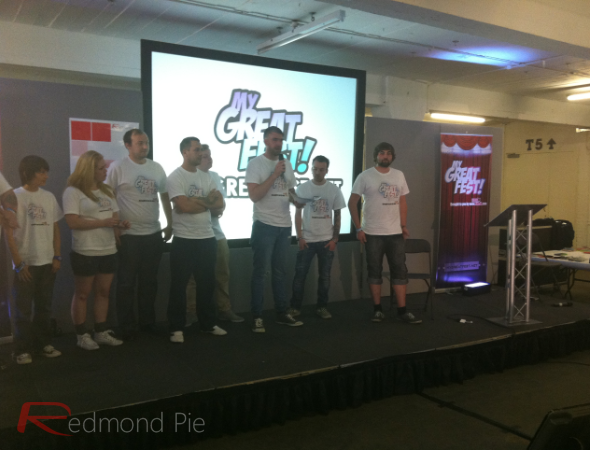 The second convention, which will be based in the US next year, will be called JailbreakCon as opposed to MyGreatFest. If you’re interested in iOS hacking, jailbreaking, developing and whatnot, next year’s event promises to be even bigger and better than what has already been achieved. 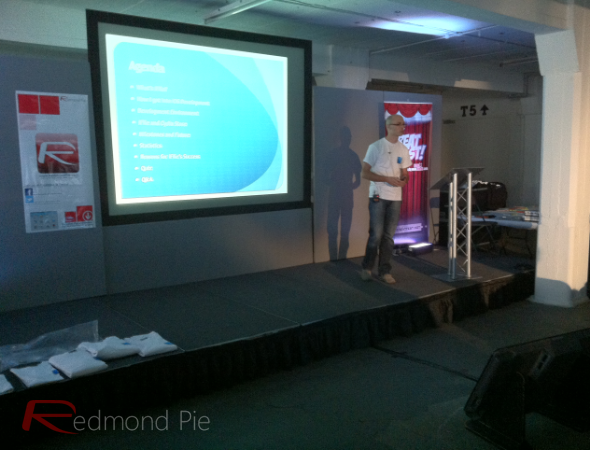 There will no doubt be members of the Redmond Pie team present once again, so if anything, it’s a chance to meet us, too! We’ll be the first to know of any details regarding date, time and venue, so stay tuned for more information.